Diet on rice bran to prevent compulsive overeating while getting rid of unwanted constipation adding rice malt to your list of foods for healthy skin that work. The rice bran diet may be your secret to prevent overeating from ruining your weight loss plans, relieve constipation without medication, and keeps your skin looking glistening clean, with the nutrition and health benefits that you get out of Japanese-komenuka. Is Japanese rice bran good for your skin if you eat it regularly in your diet? The rice bran diet whether you get it by eating, drinking, or in a healthy snack is one of the simplest diets that you will find. As for a dieting method goes, all you have to do is incorporate rice bran in your daily mealsto make getting fuller easier while drastically lowering the amount of food you eat. On top of being a great way lower the risk of eating too much rice bran is low in calories and comes with many health and skin care benefits that gives your diet the plus you've been waiting for to lose weight getting healthy more beautiful skin in the process. In this daily Slism, we present yet another great diet but this time one of those foods for healthy skin called rice bran that is said to have all the dietary fiber to prevent constipation and overeating and most importantly improve skin care in your diet. Rice bran is one of the healthiest carbohydrate foods that you can find around but don't let low calories and great skin care benefits tie your down to one diet. Give other foods with carbs a chance to make an impression so you can too. The key to a healthy diet is diversifying the foods you eat. Rice bran is a by-product of the rice milling process turning out the polished white rice that you by at the grocery store. That is to say that rice bran is what's left over from polishing brown rice into white rice. That's rice bran. The fact that rice bran is low calorie and high in nutritional value makes rice bran whole-heatedly a food that you don't want to miss out in your diet. In rice bran you will find a lot of the same essential nutrition that can be found in healthy brown rice. The rice bran diet where by simply adding rice bran to your daily meals you can benefit from the health and skin care positive effects that rice bran gives your body making slimming down beautifully the healthy way totally possible. Incorporating rice bran into your diet can be done as easily as mixing with milk or soy milk for that matter for a healthy rice bran drink, adding to your cooking such as when you are making hamburger or curry, and use in pickling for traditional Japanese-style food preservation. Mix 200mL of milk and spoonful of rice bran with a spoon in a cup of suitable side thoroughly. Although we used milk in the recipe described above, feel free to use whatever fits your personal taste preference most whether that is green tea, soy milk, or vegetable juice. Rice bran contains dietary fiber, and vitamins and minerals that come with much great health and skincare effects on your body that would be a waist not taking advantage of in your diet. Eating rice bran gives you ample amounts of dietary fiber in your diet making it easy to reach a satisfying point of fullness necessary to prevention compulsive overeating from taking away from your diet progress. There are no strict diet and calorie restriction in the rice bran diet. On top of that with dietary fiber making it easier to get full, decreasing you food intake has never been as simple as eating rice bran. In rice bran there is said to be as much as 10 times the amount of dietary fiber in spinach. This becomes a powerful tool that can be used to relieve unwanted constipation promoting improved functionality in your digestive tract, helping flush out toxins from your body that is said to boost your metabolism. Dietary fiber helps ease the dry skin and irritation that comes along with constipation along with relieving other conditions caused by constipation. In addition, dietary fibers don't get absorbed into your body during digestion but instead are flushed out. Getting more dietary fiber in your diet is said to impair the absorption of excess fat, which makes getting dietary fiber a priority when trying to reduce fat in your diet. 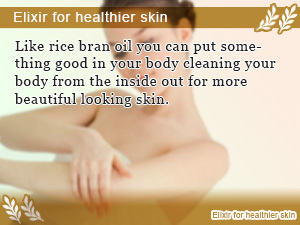 Rice bran contains vitamin and minerals such as vitamin B and vitamin E essential for maintaining skin health. In addition, rice bran contains ferulic acid and gamma-oryzanol that are said to inhibit the production of melanin while promoting skin turn-over helping you get more beautiful skin. There are many skin care products that use rice bran such as rice bran oil which tell you just how great rice bran is for you skin. Rice bran is easily oxidized. That's why you want the freshest rice bran. Just because it is in powdered form doesn't mean the expiration date doesn't apply. In addition, before using rice malt it's important to apply heat protecting your rice malt from the oxidation process. Place in a pan without oil and heat for 2-3 minutes just until the point where you start to smell the fragrance of cooked rice bran. Be careful not to burn the rice bran. Properly prepared rice bran can be kept in the fridge for up to 10 days before it's time to make another batch. When buying rice bran it's important to make sure pesticides were not used in growing the rice it comes from because if it has been used it is more than likely that rice bran made from this rice is chemically contaminated. Be careful what you buy. Looking for an easy way to strengthen your metabolism? Then stop white rice and start on brown rice. With more than twice the dietary fiber and nutrition than white rice, there is no reason you shouldn’t switch. Japanese rice balls are a stable food in Japan. That’s why the Onigiri diet is going to help you lose weight. With the lowest obesity rate, who is to say no? Nutrition tips to eat healthy and live life on a balance diet that supports your weight loss. Vitamins and minerals that you simply cannot live without taking. Get more dietary fiber and vitamin C in your diet by adding the Japanese sweet potato to your daily meals to reduce calories, remedy constipation, and get more beautiful skin. 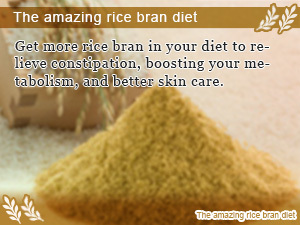 Get more rice bran in your diet to relieve constipation, boosting your metabolism, and better skin care. 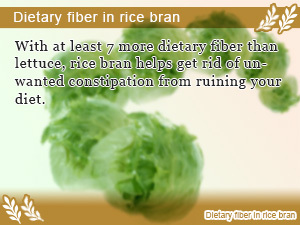 With at least 7 more dietary fiber than lettuce, rice bran helps get rid of unwanted constipation from ruining your diet. Like rice bran oil you can put something good in your body cleaning your body from the inside out for more beautiful looking skin.